According to the 2017 Distance Education State Almanac, more than 383,000 students enroll in online college schools in Arizona, with the number of online students growing 72.2% between 2012 and 2015. In 2015, Grand Canyon University served as the top school in the state for distance enrollment. Arizona's many public universities also boast high online enrollment, including Arizona State University, the University of Arizona, and Northern Arizona University. Graduates from accredited online colleges in Arizona pursue careers in education, healthcare, business, and all other sectors of the Arizona economy. This article ranks the best online colleges in Arizona. It also assesses the state of online learning in Arizona, explains tuition discount opportunities, and provides job outlook statistics for Arizona college graduates. Students attending the best online colleges in Arizona can also benefit from the list of scholarships available to online students. Prospective Arizona college students benefit from the state’s variety of colleges and universities. Arizona counts 86 degree-granting institutions within its borders, including 30 two-year and four-year public colleges and universities, according to the National Center for Educational Statistics. College students also attend the state’s 13 private, nonprofit schools and 43 for-profit institutions. In 2016, 608,084 students attended a college or university in Arizona, with over half that number taking at least one online course, according to the 2017 Distance Education State Almanac. Tuition rates at Arizona institutions vary depending on the type of school and the degree level. The College Board reports that Arizona community colleges offer some of the lowest tuition rates in the country, with an average rate of $2,580 a year in 2018-19. Arizona’s four-year public institutions charge an average tuition rate of $11,540, with the University of Arizona charging an in-state tuition rate of $12,487 in 2018-19. By comparison, out-of-state students at the University of Arizona pay $36,386 per year in tuition. Private schools typically charge higher tuition rates than out-of-state public institutions. Arizona college students fund their degrees with a mix of savings, loans, and scholarships. The state offers grant aid to students with financial need, according to the National Association of State Student Grant and Aid Programs. For example, the Arizona Financial Aid Trust awarded over $20 million in need-based grants in 2015-16. In total, Arizona students received nearly $23 million in grants to support their education that year. According to the 2017 Distance Education State Almanac, Arizona’s robust online higher education offerings serve more than half of the enrolled students at Arizona institutions. In Arizona, 383,700 students took at least one online course, representing 59.1% of all students and vastly exceeding the national average of 29.7%. Just under 300,000 of these students complete all of their college classes online. Of that number, 221,670 enroll as undergraduates and 77,550 enroll as graduate students. Arizona’s fully online students represent 46.1% of all college students enrolled across the state, much higher than the national average of 14.3%. Only 20.5% of fully online students live in Arizona, with the remainder enrolling from out of state. The Arizona Commission for Postsecondary Education works to expand access to higher education in the state. As part of that mission, the commission helps college students pay for college by offering savings plans and granting more than $2.4 million each year for college students attending an Arizona institution of higher learning. Many of the best online colleges in Arizona offer tuition discounts for the state’s many out-of-state college students. These discounts can include lower tuition rates, or even in-state tuition rates, for fully online students or for students from qualifying states. For example, the Western Interstate Commission for Higher Education (WICHE) helps lower costs by allowing out-of-state students from 16 member states and territories to attend Arizona schools at discounted tuition rates. WICHE member states include Arizona, Alaska, California, Colorado, Hawaii, Idaho, Montana, Nevada, New Mexico, North Dakota, Oregon, South Dakota, Utah, Washington, and Wyoming. During the 2017-18 academic year, over 40,000 students participated in WICHE’s Western Undergraduate Exchange, saving over $365 million on out-of-state tuition. The program caps out-of-state tuition rates at no more than 150% of in-state tuition. In addition, WICHE offers the Internet Course Exchange to increase student access to online courses offered by other institutions within the exchange program. The exchange program makes it easier for students enrolled in accredited online colleges in Arizona to take online classes from other WICHE member institutions. A leader in the arts and sciences, the University of Arizona enrolls approximately 44,000 students in 372 academic programs. UA provides learners with the opportunity to earn degrees exclusively through online learning. Those interested in pursuing a bachelor's degree online can choose from majors in law; human services; government and public service; and literacy, learning, and leadership. The school maintains a reputation for strong science programs, such as the BAAS in informatics, meteorology, and cyber operations. Notable programs include the bachelor's in information science and eSociety, which prepares learners for sociocultural issues, information management, data organization and analysis, and essential technical competencies. The school offers several 2+2 programs in which UA partners with community colleges in the AZ Transfer Pathways program. Learners complete the first two years at a community college, transferring to UA to complete their junior and senior years. Learners pursuing online master's degrees choose from majors like engineering, international security, legal studies, and management information systems. Several online certificate programs offer the opportunity for learners to earn credentials for work or personal enrichment in just a few weeks. Students study in an interactive classroom with cinematic field lectures, video discussion boards, and take-home lab kits. The school notes excellence in providing students with guidance, including in-house success specialists who guide learners to the services and resources needed to excel in coursework. Those seeking to develop leadership skills can do so online through UA's innovative Blue Chip Leadership program. UA boasts affordability, and some majors qualify for the Western Undergraduate Exchange (WUE) program where learners from states within WUE pay reduced nonresident tuition. As one of the best online colleges in Arizona, UA admission requires school transcripts and competency testing that varies by program. The school maintains designation as a Hispanic-Serving Institution and oversees a diverse learning community. Established as the state's first institution of higher education, Arizona State University-Tempe remains one of the nation's most innovative institutions. ASU enrolls 51,000 students in hundreds of programs, including 40 ranked in the top 25 programs nationwide in their respective fields. Future Sun Devils who choose to take coursework online can earn degrees that span across many disciplines. ASU Online administers baccalaureate programs in biochemistry, data analytics, criminology and criminal justice, and justice studies. Business students can earn a BA in business that offers several concentrations, including global leadership, retail management, and food industry management. ASU offers several other innovative online programs, including the BA in sustainability for those wanting to tackle challenges related to society, the economy, and the environment. Graduate students can earn a master's degree in traditional programs, such as curriculum and instruction or healthcare, or they may choose from unique majors, such as biomimicry (the first of its kind in the nation) or indigenous education. Faculty delivers baccalaureate programs using seven-week courses. The school provides learners with extensive support so they can successfully complete program requirements. Tutors help learners overcome academic challenges, while success coaches acclimate students to the virtual classroom. ASU Online, one of the best online colleges in Arizona, offers affordability with no out-of-state tuition or additional program fees. Students can help pay for their education using the school's comprehensive suite of financial aid. Learners who begin their education elsewhere can join 25,000 transfer students at ASU Online. The school enrolls transfers who hold an associate degree or are in the process of completing one. Freshmen must meet competency requirements in English and math. Northern Arizona University continues a 120-year tradition of academic excellence with 160 programs offered at the main campus in Flagstaff, on community campuses, and through online learning. NAU's student body, comprised of about 30,000 students, learn in classrooms with an 18-to-1 student-to-faculty ratio. Students who plan to earn a degree online can choose from 86 different programs. NAU offers an innovative classroom that allows students to decide how they want to learn. Those who choose a structured learning format benefit from multiple start dates, credit-based tuition rates, and organized course schedules. Alternatively, the self-paced option gives learners much more flexibility through weekly start dates, a flat subscription rate, and the ability to customize scheduling. One of the accredited online colleges in Arizona, NAU manages a catalog of online bachelor's programs in various disciplines, including the arts and humanities, business administration, and computing and technology. Those seeking a program with great flexibility, or one that allows them to design a study plan in consultation with an adviser, choose the bachelor in interdisciplinary studies. The program offers many specializations, including education, business administration, and justice studies. NAU also offers a series of personalized learning degrees in which students focus on theory-to-practice education in management or small business administration. Learners seeking to pursue a graduate degree can do so in education, nursing, or public administration. Online learners sacrifice nothing in terms of resources, benefitting from peer coaching and mentoring for every first-year undergrad. Student success coaches help learners achieve academic goals from day one, and online learners access free tutoring. NAU boasts status as one of the most affordable colleges in the state. Admission requires school transcripts, with transfer students needing a minimum cumulative 2.5 GPA (2.0 GPA for associate degree holders). A school originally dedicated to aviation studies, Embry-Riddle Aeronautical University-Prescott provides learners worldwide with a comprehensive array of programs. Students learn on residential campuses in Florida, Arizona, and online. The school boasts the first space flight operations and unmanned and autonomous systems engineering programs in the nation. Embry-Riddle's worldwide campus provides learners with the opportunity to acquire training in some of the nation's fast growing industries. The school's select online associate degrees cover majors in aeronautics, aviation business administration, and aviation maintenance. In addition to baccalaureate aviation majors, Embry-Riddle offers online majors in engineering, homeland security, and project management. The unique BS in unmanned systems offers three separate tracks: operations, administration, and development. Notably, the virtual campus helps online learners experiment, develop, and test unmanned aircraft systems using innovative technology in the school's virtual crash and aerial robotics labs. The school offers learners with a minimum 3.0 GPA the opportunity to earn a bachelor's and master's degree online in five years through the 4+1 program. The available 4+1 options include the BS in aeronautics to MS in aeronautics and the BS to MS in unmanned systems applications. Faculty deliver virtual programs using nine-week sessions with multiple start dates throughout the year. Online learners do not pay out-of-state tuition, and military students receive significant tuition discounts. The school enjoys national ranking for its educational services for students in the military. Embry-Riddle streamlines the application process for all students, including transfers. Applicants earn credits for military experience and the College Level Examination Program or Defense Activity for Nontraditional Education Support prior assessments. Ottawa University-Phoenix specializes in educating nontraditional students, and many of the school's learners come from underserved populations. Affiliated with American Baptist Churches, the school works to prepare learners for lives of faith, service, and leadership. In addition to campuses in Kansas, Indiana, and Wisconsin, Phoenix students can earn degrees through a virtual campus with a comprehensive portfolio of programs. One of the best online colleges in Arizona, Ottawa University emphasizes theoretical learning that translates to practical application facilitated by faculty who bring real-world experiences to the classroom. The school's catalog of online programs includes bachelor's degrees in accounting, business administration, law enforcement, and human services. A bachelor's degree in public safety administration offers three tracks that prepare learners for careers in emergency management: emergency medical response, fire protection, or public safety. In keeping with the school's Christian heritage, Ottawa University offers a bachelor's in Christian ministries that examines the Bible, theology, and philosophy to prepare learners for a professional ministerial career or graduate school. Learners pursuing teacher preparation can earn degrees in English, history, business administration, and math. Notably, Ottawa University's teacher preparation programs hold approval from state departments of education or state boards of education in Kansas, Wisconsin, Indiana, Missouri, and Arizona. Graduate programs cover a select number of majors, such as counseling, accounting, and nursing. Ottawa University's flexible schedules accommodate busy working professions, as faculty deliver programs using eight-week sessions to facilitate accelerated learning. The school supports online learners with 24/7 support services and allows students to earn credits for military service, the College Level Examination Program, Defense Activity for Nontraditional Education Support assessments, and national registry/certification. Ottawa University offers affordable tuition and a reduced military student rate. Established in 1964 to train healthcare workers, CollegeAmerica offers degrees through nine campus locations in Colorado and Arizona and online programs. The school's expanded catalog addresses a growing need for skilled workers in business and technology. CollegeAmerica teams with Independence University to provide virtual learners with select online degrees that they can complete in fully online or hybrid formats. Students earn associate degrees in as few as 20 months in medical specialties, graphic arts, and business management. In as few as 36 months, learners with prior college credit can earn a bachelor's degree in accounting, nursing, health information management, or web design and development. Students interested in a BS in business administration can specialize in human resources, media marketing, and technology. The school's five master's degrees include an MBA, an MS in nurse education, and an MS in information systems, all offered online in an accelerated learning format. 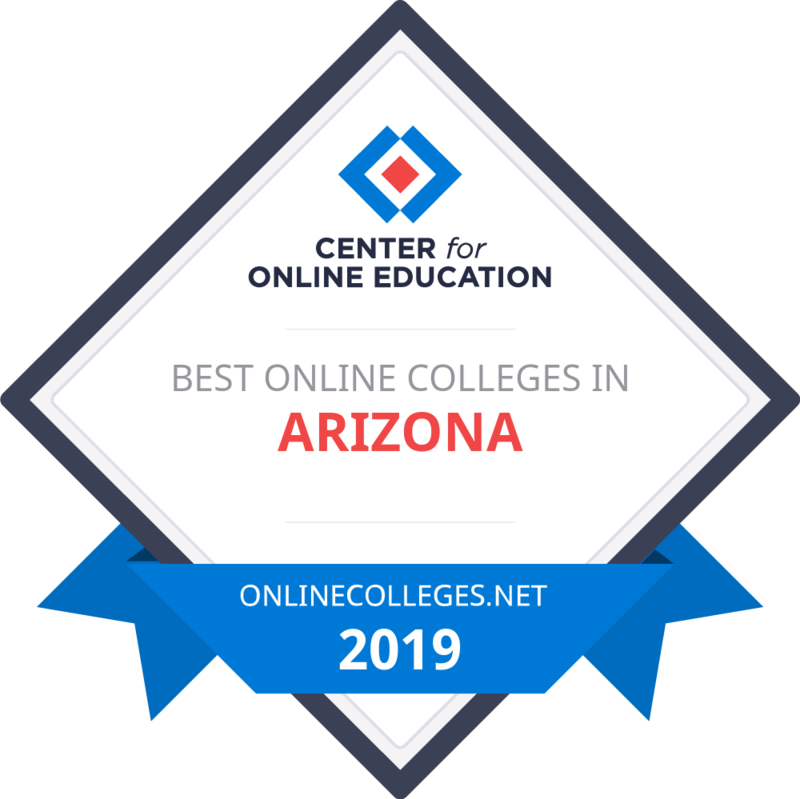 CollegeAmerica, ranked one of the best online colleges in Arizona, provides learners with comprehensive support services, including one-on-one tutoring from peers or school staff. Through the online student portal, learners gain access to resources for research, community events, and social media. The Career Services team helps students expand their professional network and gain employment. CollegeAmerica works with military students to identify grants, scholarships, and tuition assistance to help fund their education. All students pay affordable tuition that includes the cost of textbooks, lab fees (if required), and a laptop that learners can keep after graduation. One of the top accredited online colleges in Arizona, the school allows learners to transfer a generous number of credits. Applicants can also earn credits for the College Level Examination Program, industry certifications, and military experience. Below you’ll find the online schools in Arizona sorted by lowest tuition rate. 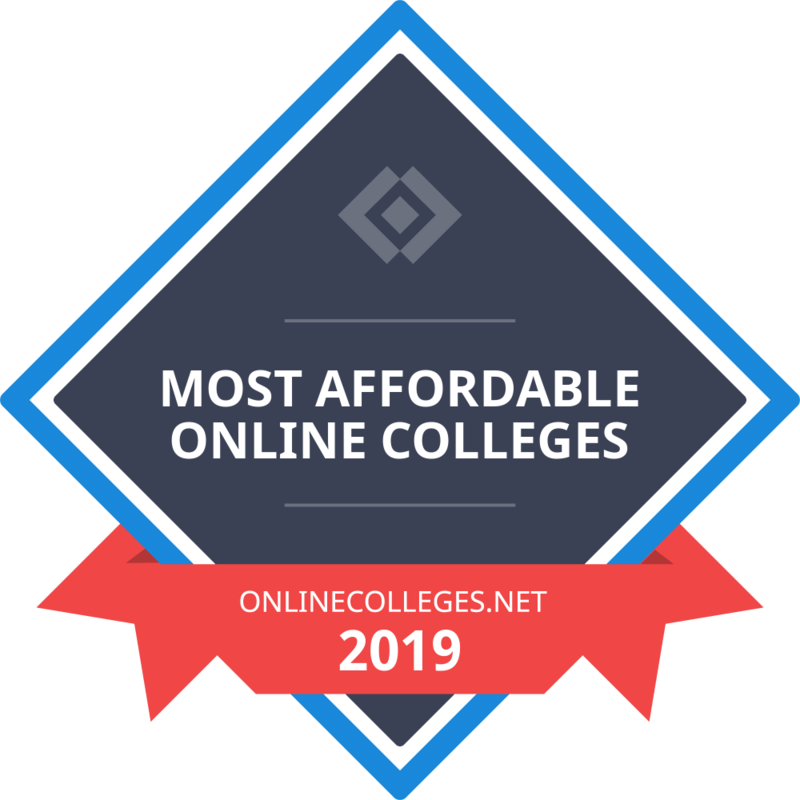 Our list of the most affordable online schools in AZ is based on in-state yearly tuition, or annual tuition rates if a school does not differentiate between in-state and out-of-state students. Tuition rates are based on a full course load each semester or term. All colleges on the list offer at least one bachelor's degree completion program available entirely online. Those institutions with the lowest tuition are ranked highest, providing prospective students with a true list of the most affordable online colleges in their state. In Arizona, college graduates join a strong economy that employs over 2.7 million workers, according to the Bureau of Labor Statistics (BLS). Those employees earn a mean annual wage of $48,160 across all sectors in the state, and typically college graduates earn higher salaries than those without a college degree. Earning a college degree also makes professionals more competitive in the job market and leads to lower unemployment rates. As a study conducted by Georgetown University found, college graduates make $1 million more in wages during their lifespan than those without a college degree. In September 2018, the BLS reported a 4.6% unemployment rate in Arizona, slightly above the national average. Research shows that college graduates benefit from a lower unemployment rate than average. For example, the BLS reported in May 2018 that the national unemployment rate stood at 3.9% while the unemployment rate for professionals with a college degree stood at 2.1%. Arizona boasts several strong industries, including aerospace, business and financial services, technology, and healthcare. Within these sectors, college graduates work as sales representatives, managers, software developers, and registered nurses. Many of these jobs offer above-average salaries. Registered nurses, for example, earn an average salary of over $75,000 in Arizona, while management occupations average six-figure salaries. Graduates from an Arizona high school attending an Arizona community college, four-year college, or university who demonstrate financial need may qualify. With one application, college students can qualify for more than $1 million in scholarship opportunities; eligibility requirements vary. Undergraduate and graduate students at an accredited college or university earning a degree in project management or a related field may quality. Applicants must be Arizona residents. Women who are 21 or older qualify if they plan to return to a community college to improve their job prospects. Full-time undergraduate or graduate students with Korean heritage currently living in Arizona qualify with a minimum 3.0 GPA. Arizona residents earning a degree related to wildlife science qualify. Recipients must attend an accredited college or university with a minimum 2.7 GPA. Arizona high school graduates planning to pursue an agricultural degree qualify for the scholarship, including online students. Arizona Roman Catholics of Italian descent or those with a parent, guardian, or grandparent who is a member of the federation qualify with a minimum 3.2 GPA. Current, dues-paid FBLA members with a minimum 3.0 GPA qualify for the scholarship. Arizona residents enrolled part time or full time at an Arizona college or university qualify if they demonstrate substantial financial need.